The 3D Pen is a tool for freehand drawing of 3D objects . It is compatible with ABS PLA Material . Ergonomic design for optimum handling Durability . Adjustable output speed . Filament colors can be changed easily by pressing a button . LED indicator to check the operating temperature . Hippo 3D pen is ideal for children of all ages. Create your own 3D models freehand. Moletn plastic comes out of heated pen tip. The plastic solidifies on cooling in air and forms shapes as drawn. Many 3D models can be made, such as Eiffel tower, buildings, animales, Machine parts, etc. 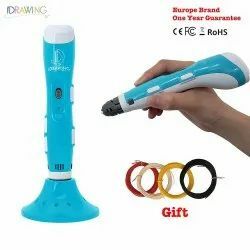 3D pen are use for Making freehand models. Compact and easy to use, the 3Doodler extrudes heated plastic that cools almost instantly into a solid, stable structure; and with no computers or software needed, the possibilities are limited only by your imagination. Simply plug your 3Doodler into a power socket and start drawing anything within minutes. 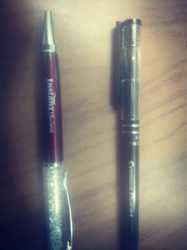 Our company has created a niche in the field of offering 3D Printing Pen. Draw Flat: Draw on a flat surface to form your base. Product Description Use it just like any other kind of pen by drawing in most cases at first, with the nib pressed to paper, Your hand movements can create the art as the 3D pen follows your movement and command as It may be used to draw in the air or on surface as well as tracing objects on paper.